This station drill is similar to the previous drill but now the cones are lined up perpendicular to the net. The key focus areas are control turns, forward and backward tranistions while giving and receiving passes, and shooting right after a lateral move. The drill is set up as shown. The coach will set up on the dot with the cones lined up about 2 stick lengths off the wall and 2 stick lengths apart. The first player in line carries a puck down the wall to the second cone and makes a tight control turn. 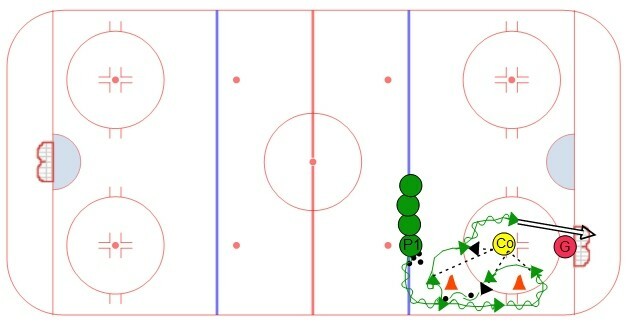 They make a pass to the coach and transition backwards as they receive the pass back from the coach. They control the puck around the cone and make another pass to the coach. The coach will bump the puck back to them so it ends up about a stick length in front of the coach. The player will pick up the puck while faking to one side with their shoulder and moving laterally to the other side. The goal is to get the goalie moving laterally while taking the shot.